New Delhi, Dec 8 2014: Calling key people from all spheres of the industry to partner with the government to bridge the gap of skilled workforce in the country, Minister of State for Skill Development & Entrepreneurship (Independent Charge) Shri Rajiv Pratap Rudy today said that realizing Prime Minister Narendra Modi’s vision to make 500 million people industry ready in India requires a broader partnership as independent effort from the government is not going to bear fruit. “There is eagerness in the society and industry about skill development. People want this to happen but this is not happening. To let this happen, there is a need for industry people to come together and work alongside the government to achieve the vision of our Prime Minister which is to train the 500 million workforce of the country as it is a challenge to put people into right work. There is so much for us to learn from China which has effectively moved 400 million people from farms to cities and to factories,” Mr Rudy said while inaugurating the three-day Global Symposium, organized by Project Management Associates (PMA), the apex body of project managers in India, here. Leading project managers, executives, and project directors who have helmed successful projects in leading national and international institutions like NASA, DRDO, GAIL, ONGC, among others, have come together for the Global Symposium to discuss the need to instill project mindset in India and to boost the rate of success of execution in completing critical projects. The Global Symposium is organized by Project Management Associates (PMA), the apex body representing project managers in India that has been working incessantly over the past 2 decades to highlight the gap between planning and execution of projects in India. PMA is the Indian Member Association of the International Project Management Association (IPMA). Among the experts and leaders who addressed the conference on the first day were Dr A S Pillai, former MD & CEO, BrahMos Aerospace who spoke on "Project Mindset: Powering the Nation's Development"; Dr. G S Krishnan, GWU Researcher and Program Manager, NASA/Goddard Space Flight Center spoke about "Project mindset - the key to competitiveness"; while Dr. Manas K Mandal, Distinguished Scientist & Director General, Life Sciences at DRDO spoke about "Managing Human Capital In Projects". Mr Adesh Jain, National President of PMA & Chairman, I2P2M, who is the brain behind spreading the idea of ‘project mindset’ delivered a talk on "Why in the 21st Century, only project mindset matters". “Project mindset is a condition of 'holistic' state reflecting seamless connectivity of benefits/realization first to its execution later. In this process, we focus on conclusions first. In a way, we can say that in project management, we must choose the RIGHT PROJECT before executing the PROJECT RIGHT. The selection of the right project can take place only if we look at the various conclusions first. Sometimes, unforeseen obstacles delay projects for long periods leading to massive rise in costs and budgets. All this needs to change. And it will change when we have more professional project managers at the helm of affairs. Thankfully, India is rising up to this need,” says Mr. Adesh Jain, a visionary leader shaping the project management profession globally whose mission is to create a project oriented society. Over the next two days, Mr Nitin Gadkari, Union Minster for Road Transport, Highways & Shipping, and several veteran project handlers, including Dr. A Karnatak, Director (Projects), GAIL (India), Mr. R. Ramanathan, Director (Projects) Chennai Metro Rail Ltd; Mr. Rajeev Bhadauria, Director Group HR, Jindal Steel & Power Limited (JSPL) and Mr. N K Verma, Managing Director, ONGC Videsh will share their experiences and take-aways from the critical projects handled by them. 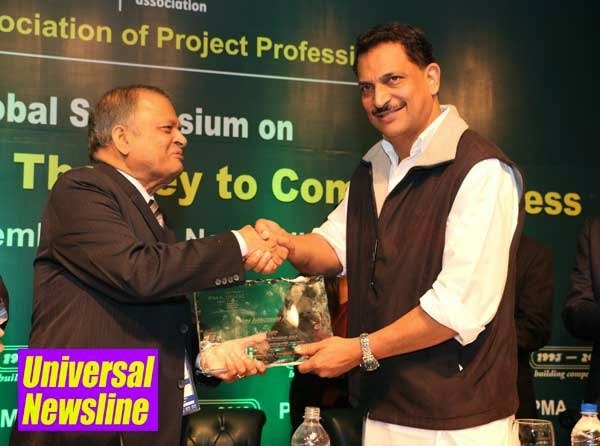 In the meanwhile, Mr Rudy conferred upon Mr Jain the Lifetime Achievement Award in recognition of his efforts to create a project-oriented India. Mr Jain is globally acclaimed for his initiative to train managers in project management and create a right mindset for the same. Among his major achievements, Mr Jain was elected as the first non-European President of IPMA in its history of 49 years, and the Government of Turkey released a postal stamp (limited edition) in his honour in 2010 during the IPMA World Congress.